Sometimes the smallest things in life are capable of the most amazing feats. We have all heard of a flea circus, well could imagine a complete water treatment facility run by robot-charged bacteria that produces alternative energy? Earlier this week, an army of bacterial robots started their first reconnaissance mission to purify Cincinnati, Ohio’s water supply and generate renewable energy in the process. These genetically enhanced microorganisms—dubbed bactobots—are part of a $1.7 million pilot project at Cincinnati’s Environmental Protection Agency. The project goal is to determine how the technology can be commercialized for use by a range of industry sectors, including municipal wastewater plants, food and beverage companies, and more. During the pilot program, the bactobots, so named because they labor like machines encoded to perform precise tasks, will be placed in an electrogenic bioreactor, or fuel cell. Wastewater is run through the fuel cell and treated inside it. Clean water emerges from one end of the reactor; energy emerges from the other in the form of hydrogen gas. At laboratory scale, when a mini-reactor held 10 gallons of water, the bactobots generated enough energy to charge a cell phone for five hours. An industrial-size reactor would hold millions of gallons of water, Sung said. Untreated wastewater is a global problem. Each year, two million tons of sewage and industrial and agricultural waste is dumped into the world’s waterways, according to the United Nations Environment Program. This contributes to the deaths of 1.8 million children annually from waterborne disease. Even in the United States, thanks to broken pipes, equipment failure, or system overload, untreated sewage is discharged approximately 40,000 times a year, the EPA estimates. Because Cincinnati processes one of the largest volumes of wastewater in the U.S.—300 million gallons a day, much of it coming from the industrial sector, including Procter & Gamble—the pilot project is ideally located. The waste stress is higher in Cincinnati compared with other locations, said Ting Lu, an environmental engineer working on the project with the sewer district, which means the city has to spend more money and use more resources to treat the detritus. “If you are using a biological treatment system, it uses more oxygen and increases energy use as well as operation costs, so Cincinnati’s mission is really to find innovative approaches to cost-effectively treat wastewater,” Lu said. “Since we’re looking to save energy and remove high-strength waste, bactobots can bring us a lot of value,” she added. Robots, like people, come in all shapes and sizes. Bactobots, while not as mechanical as Atlas, offer the promise of solving problems at the most basic molecular level. 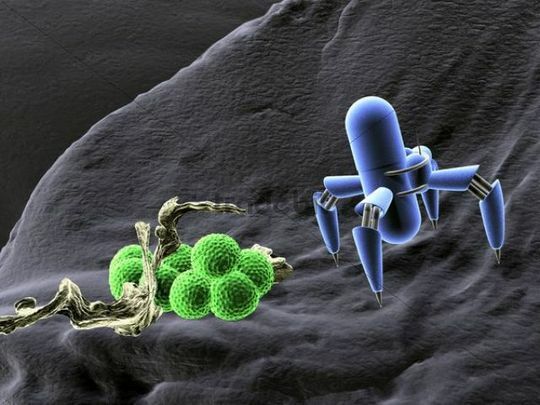 Is Bacteria, friend or foe, well when combined with a robot, very much a friend.